The recent global mining environment with severely depressed prices and little investment in new projects has forced mining services contractors to permanently adapt the services they provide. The market is more competitive than ever with competitors offering lower and lower prices and clients demanding the same quality of work. RSV ENCO has been able to capitalise on its vast experience, major project portfolio and specific coal expertise to weather the storm and come out on the other side. RSV ENCO is a linked enterprise of the RSV group of companies. The parent company, RSV (Pty) Limited was formed in 1991 and has built up a 25-year reputation of experience primarily focused on deep level, hard rock shaft sinking projects. Having grown rapidly thanks to the 2007 platinum market boom, RSV peaked at almost 1,300 employees. The RSV group of companies has operations across Africa with linked enterprises in Mozambique, Botswana and Zambia in addition to a global footprint from companies established in the USA and Australia. The RSV directors Hennie Reed, Mike Swatman and Rodney Voigt took the strategic decision to diversify outside of their core area to form the linked enterprises spawning RSV ENCO in 2008. 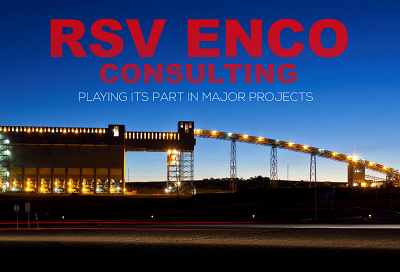 The RSV ENCO division focuses on providing specialist professional engineering and project management services in the coal mining and energy industries. It has been instrumental in some of South Africa’s biggest coal projects since it was formed and has built up a project portfolio any engineering and procurement managing consultant/contractor (EPCM/EPC) would be proud of. RSV ENCO CEO Alan Wingrove prides the company on its ability to service projects from the consultation stage right through to implementation. He says it is important for clients to be able to utilise the services of a single managing consultant throughout the life cycle of a mine to boost efficiency and maintain specific project knowledge. In addition to the time advantage Wingrove says there are unquantifiable advantages in terms of the intellectual property a managing consultant develops on a specific project working it through the feasibility stage. The vastly experienced CEO adds that the way RSV ENCO selects its practitioners, bringing people on board who have engineering and design capabilities as well as operational experience, is a key factor in setting it apart from its competitors. “It is difficult to quantify the intellectual property that resides in the project team with all the little nuances that go on in terms of decision making that are certainly of benefit to the clients. We’ve managed to get them right on all the projects we’ve worked on. Wingrove says the most important element of a successful contract on any project revolves around the team that is put in front of the client for the duration of the project. He says the process of team selection and ensuring the operational experience is incorporated can better define the engineering solutions that are put forward to the client. RSV ENCO’s project success comes down to the quality of the work conducted at the feasibility stage according to Wingrove. He believes RSV ENCO can identify the key issues in a feasibility so the client can assuage the risks and complete a successful project. The model is based on realistic early financial modelling which allows the clients to take decisions in good time. While it may seem beneficial to a consultant to let the process drag out over time it does not match with Wingrove and RSV ENCO’s ethical approach. The first major project which RSV ENCO were contracted for was Total Coal’s Dorstfontein East coal mine. Located near Kriel, Mpumalanga in South Africa, the Dorstfontein East mine was a 3 million tonnes per annum (mpta) open pit mining operation with a capital value of around R1.3 billion. RSV ENCO was appointed as the EPCM managing consultant to complete a pre-feasibility study and feasibility at the mine and then subsequently to take the project through to implementation. RSV ENCO has delivered two major projects for Sasol Mining. The first being the Thubelisha Shaft Project, a 10mtpa underground coal mine with a capex of R3.3 billion. RSV ENCO again completed a review of the feasibility study and were appointed on the implementation stage immediately. RSV ENCO had a managing consultant role on the project in a joint venture with Goba Engineering at Sasol’s request. The second Sasol Mining project, the Impumelelo coal mine, played out in a similar role to Thubelisha. RSV ENCO were appointed for the pre-feasibility study, the feasibility study and then contracted for implementation on the 10.1mtpa underground mine. The EPCM managing consultant role was again a joint venture with Goba. Another of the early contracts that RSV ENCO secured was a raft of work on Resource Generation’s (ResGen) Boikarabelo coal project in South Africa’s Waterberg region. The company established a relationship with ResGen in 2008 and have worked on the project until today. “We went through the various stages of ramping up the value chain in terms of the initial study work. Then the ResGen board opted to commence with the early works construction and we mobilised and had a major team on site,” says Wingrove. RSV ENCO are contracted with Sedgman for some early engineering to assist on providing an EPC price for ResGen, Wingrove hopes that if the project goes ahead and Sedgman are on board RSV ENCO would have an opportunity to continue to work on that side. Despite the financial setback for RSV ENCO, it has continued to work on the project in different areas, particularly focused on ResGen’s desire to install a coal-fired IPP (independent power producer) on site. RSV ENCO was keen to enter the energy side of the market at this stage. Wingrove says RSV ENCO foresaw the mining sector downturn in 2012/2013 and decided to diversify out of coal and into energy. South Africa was facing a crisis around power supply at the time. ResGen are now in a healthy position to take Boikarabelo forward having recently appointed a new board and new CEO Rob Lowe securing $550 million in funding for the project. The new board reinitiated the IPP study and RSV ENCO were contracted to complete a concept study for a 300MW power station. Following completion RSV ENCO’s recommendation was that ResGen should pursue a 450MW or 600MW facility. The well-documented downturn in global commodity prices has forced mining services companies to adjust their operations if they want to survive in the current price environment. Wingrove says that while it has been a difficult period, being able to lean on the RSV group of companies has benefited the company. “There’s been a dearth of large projects, that’s where we want to be but we’ve had to change our mindset and refocus on smaller studies. We’ve had to downscale significantly and our revenue has dropped off dramatically but we have managed to retain our core skills. Now Wingrove is optimistic for the coming years based on the number of enquiries RSV ENCO is receiving. He says the company has a number of opportunities for large projects that it could be in a position to win in the coming months. RSV ENCO has tendered on South 32’s Khutala life extension project which would be a significant contract spanning 10-12 years, starting with a feasibility study and going on to implementation. Wingrove hopes to be successful there. Beyond that, state-owned African Exploration and Mining Finance Corporation is moving ahead with the T project and RSV ENCO has already completed the feasibility study there. Wingrove believes they are well-positioned to win the contract for the construction phase commencing in Q1 2017. Wingrove explains that the contracts RSV ENCO wins and completes successfully is supported by key businesses in the supply chain. For shaft sinking RSV ENCO have worked with Murray & Roberts Cementation, Grinaker LTA and Shaft Sinkers. For civil construction it works with the likes of Stefanutti Stocks, Wilson Bayly Holmes-Ovcon (WBHO), Liviero, Basil Read, Group 5 and other major players. So while RSV ENCO has faced a tough period, the company has proved its agility through downscaling, implementing cost efficiencies and retaining its expert staff base to manoeuvre the depressed price environment. It appears that there is light at the end of the tunnel for RSV ENCO as pipeline projects begin to appear and the enquiry book begins to fill up.